Do you fear making a throwing error? Have the yips made you apprehensive to take the field and lowered your overall confidence? The yips can affect baseball players of all ability levels. For example, the yips have altered how Chicago Cub starting pitcher Jon Lester plays the game. Lester has 127 wins over the course of his 10-year MLB career and has been pretty consistent ever since his rookie season. Unfortunately, fear of errant throws has caused Lester to yip when attempting to pick off base runners over the past several years. Lester’s fear of yipping is very pervasive. Not only Lester not attempt pick-offs, he avoids checking base runners altogether. Lester hardly ever attempts to pick off runners or even throw over to first to keep runners honest. Lester hasn’t picked off a runner since 2011 and once had a stretch of 66 games in which he never even checked a base runner. Lester, a left-handed pitcher, consciously chooses to not even keep runners honest by holding them close to first base, a task that should be relatively easy for southpaws. Lester also opens himself up for being vulnerable to bunts and stolen bases. The St. Louis Cardinals sensed Lester’s fear of checking runners and stole three bases in Lester’s Cub debut against the St. Louis and, still, , Lester never once threw over to first. In April 2015, Lester made two pickoff attempts against the Cincinnati Reds resulting in two wild throws. Lester tried to explain the yips away by saying his errant throws were caused by a lack of repetition. Even Cubs manager Joe Maddon has downplayed Lester’s yips issues. The yips can get into your head, create fear, change your approach to the game, lessen what you can do on the field and change the way you play the game. Fear of making an error and overthinking the throw leads to yipping (involuntary muscle jerks). Yipping results in errant throws and more fear and over-analyzing … and the cycle continues. 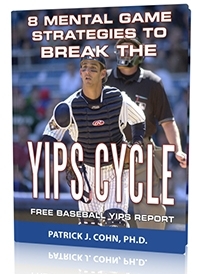 The more times the yip, you run through the yips cycle, the more entrenched the problem becomes. 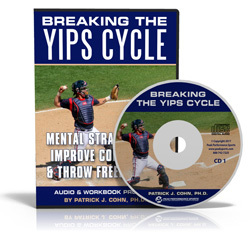 The key is to overcome the yips to interrupt the cycle at each stage. Identify the best case scenario – Fear comes from ruminating about worst case scenarios. Fearing what might happen often becomes a self-fulfilling prophecy. Thinking the best case scenario is a better self-fulfilling option and keeps your head in the game. 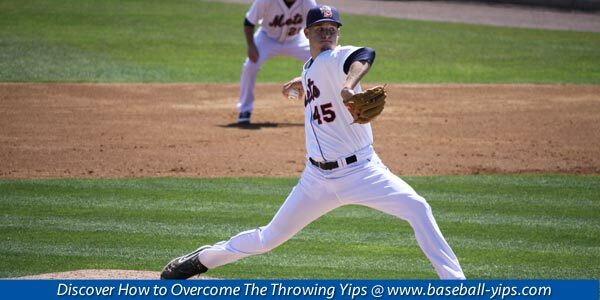 Download Our FREE Baseball Throwing Yips Report Today! 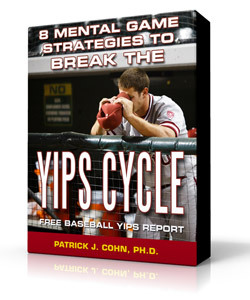 Beat The Throwing Yips With Expert Mental Game Coach, Dr. Cohn!